I have decided to use the project as an exploration of a subject I am interested in as a way to follow the interest and gather information in one place. It is really a simple and personal blog which I don’t intend to be seen by the world, as I am not a scholar of the subject. I think it is a good exercise for me to learn to create/structure a blog. • links to sources for materials: kidskin, ground pigments, tempera materials, gold leaf, etc. Artists and amateur aficionados interested in the methods and historical canon of illuminated manuscripts. While in any work-related situation I use and appreciate the structure of an editorial calendar, I don’t think I would really have a use for one here. This entry was posted in Projects on 8 December 2014 by Margaret Connelly. I was wondering if you can help me brainstorm new ways of reaching my potential audience. Right now, I am at the top of the Chilly Hollow Links List (a non-profit needlepoint blog which promotes all sorts of needlepoint endeavors.) Almost all of my readership comes through this portal, initially. My home away from home – Store in Everett, WA. An obvious first step is through placing direct advertising within the bi-monthly or quarterly newsletters of the American Needlepoint Guild, The Embroiderer’s Guild of America, Needlepoint Now magazine, and TNNA (a national professional group for Needlework Merchants and Teachers.) But I often wonder how many women would read my ads. I know I do have another option – like submitting how-to articles to needlework magazines with the hope of being published. Beyond Plan A and Plan B, my imagination needs some help. I welcome any “out of the box” suggestion you could offer me. The expansion of readership is a common goal we share. This entry was posted in Projects and tagged "web design" on 10 November 2014 by jean. I started this blog in order to record my travels and share them with friends. The last two years I have been very fortunate to be able to go on “vacations.” I like everything about travel. I like the adventure, the learning, the meeting of new and interesting people and of course the picture taking. I hope to develop the blog and my website into a portfolio of writing samples and media to showcase for future freelancing jobs. This entry was posted in Projects on 4 November 2014 by Chrystal Vavoulidis. This entry was posted in Assignment, Projects on 22 October 2014 by Margaret Connelly. I got lost a lot in looking at the available themes and discovered that simplicity is probably the way to go for me, at this tenuous stage of the game. I like this Zuki theme for its easily accessible categories. It seems like a good way to bring unity to what may be a blog with several possibly random themes, as mine will be. 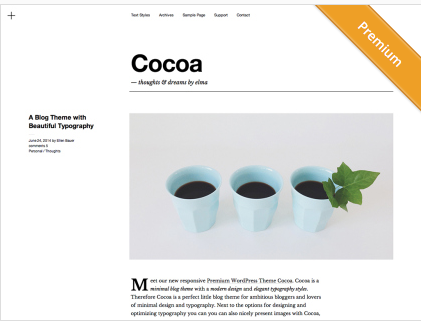 Cocoa is a clean, uncluttered theme with good typography. It feels bright and fresh. The extensive use of white space makes me feel as though I have lots of room to breath. Many of the themes I looked at made me feel claustrophobic and like I didn’t know what to look at first. I find this theme leads me in a simple trail of breadcrumbs, easy to follow and I know where my my eyes need to go without effort. This theme, Spun, is my favorite. I love it for its graphic simplicity and use of bold, round buttons. I would need to develop a set of graphic symbols or photographic representations to use with this. I would also probably want to use a text tag with each one, as I do not have a blog theme clear enough to navigate with just graphics. This entry was posted in Projects on 22 October 2014 by Margaret Connelly. I discovered an active market for templates in this vein. I find this online resume option very attractive for its simplicity, both visual and graph. This sample resume for a graphic designer offers a subtle gray/black and white format featuring identification, picture, brief text and contact information. Three bright circles bring up links for a resume, work examples and a skill-set list. This is a completely professional option, with no personal information, presented as a template for purchase on the Wix website. This article from mishes.com has some good tips for graphic designers about how to build your online portfolio. 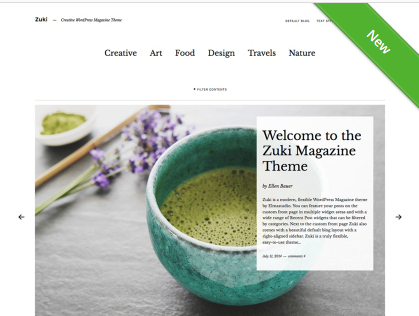 It includes several examples, more complicated, creative and exciting than the Wix template, and I plan to spend some more time with it. It discusses current options for showcasing work online, such as Behance, Coroflot, and Tumblr. 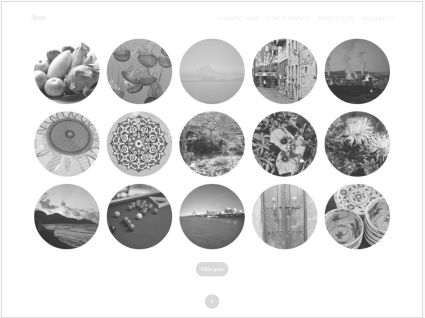 Webneel.com has a relevant article, 27 Beautiful Portfolio Website Design Examples that will make you rethink your portfolio site. These portfolios include a broad view of many fields, including web design, painting, drawing and photography. It also has an interactive little feature called, “How to create a website in 3 easy steps,” which appeals to me as a beginner. These are good options for me to explore, as I am quite new to this and need exposure to the basics.